The Grand Hotel Majestic “già Baglioni” is the oldest and most prestigious luxury hotel in Bologna, and it’s as perfect as it gets. We’ve visited Bologna many times before, as it is one of our favorite cities in Italy. Located in the Emilia Romagna region, the city exudes many of the artistic, architectural, culinary and cultural charms that make Italy such a popular tourist destination without the hoards of visitors and long queues that characterize cities like Florence, Rome and Milan. Bologna boasts one of the best-preserved city centers in all of Europe. Here, visitors can truly experience the continuity of the Italian lifestyle that has existed for centuries in way that isn’t possible in many other places. During prior visits, we’ve stayed at several hotels in the city center and even rented an apartment overlooking the main square. However, this time we were staying for a long weekend before a road trip with two other couples and opted to book three rooms at the Grand Hotel Majestic “già Baglioni,” the only five-star hotel in the city. This magnificent hotel deserves every one of its stars and more. The hotel is located on Via Indipendenza, a busy shopping street in the historic heart of the city. Its entrance is directly across the street from the Cathedral of St. Peter. Destroyed by a fire in 1141, most parts of the restored cathedral date back to the 17th century. With a rich history of its own, the hotel is housed in an elegant palazzo designed by Alfonso Torreggiani, an Italian architect of the Rococo period. The building was first built as a seminary, commissioned by Pope Benedict XIV in 1732, and was converted to a hotel in 1912. From the hotel, it is only a short walk to the Piazza Maggiore, the virtual living room and center of life in Bologna. The square houses the most important city buildings (financial, religious, cultural and governmental) as well as the impressive Basilica of San Petronio, the fifth largest church in the world. From here, visitors can wander the city’s winding cobblestone streets that span out from it like the spokes of a wheel. The hotel is within easy walking distance of the city’s famous Two Towers (Due Torri), ancient shops of the Quadrilatero, museums and the train station. This boutique property has 109 rooms and suites. We stayed in room 216, on the second floor of the four-story building overlooking the cathedral and rooftops. Soundproof windows buffered any street noise. Our deluxe room had a king size bed with a Murano glass chandelier hanging from the high ceiling overhead. The tastefully decorated and very comfortable room was furnished with a mix of antiques and classical reproduction pieces. It offered all the modern luxuries and conveniences one could ask for, including a flat-screen TV, high-speed internet connection, in-room safe and Carrara marble bathroom with stall shower. The room was immaculately clean with twice-daily housekeeping that reliably replenished the plush white towels and complimentary bottled water. At night, my husband found his pajamas placed at the end of the uber-comfortable bed. They looked so carefully folded that we thought they might have been ironed. Over the years, royalty and celebrities (including Princess Diana, Frank Sinatra, Ava Gardner and Jennifer Lopez) have occupied the opulent suites at the Grand Majestic. Breakfast is served in two adjoining rooms with white parquet flooring. Weather permitting guests can also dine at the outdoor Winter Garden with trompe-l’oeil frescoes. The full buffet breakfast is included in the price of room. It includes an extensive array of local products (meats, cheeses, fruits, breads and yogurt) and international breakfast dishes (eggs, pancakes and quiche). The hotel describes the food products as “zero mile organic” because they come from nearby farms and producers. The delectable cakes and pastries come from Gamberini, the oldest bakery in Bologna, which is worth a visit in itself. A passage off the breakfast rooms leads to an amazing preserved stretch of archaeological remains of the Roman Road from 2200 years ago. I Carracci Restaurant, the hotel’s formal gourmet restaurant, is located off the main lobby beside Café Marinetti, the intimate hotel bar. Both lunch and dinner menus showcase the traditional cuisine of Emilia-Romagna, including such dishes as tortellini, tagliatelle and lasagna with a contemporary flair amidst a setting adorned with ceilings decorated with sixteenth century Baroque frescoes from the Carracci school. The hotel also has a contemporary Fitness center with Technogym equipment and spa with Turkish bath, sauna and steam room to relax after exploring the city and its environs. The Grand Hotel Majestic“già Baglioni,” the oldest and most prestigious hotel in Bologna, is a member of the Leading Hotels of the World and part of the Duetorrihotels group. In our experience, the difference between a great hotel and a very good one always boils down to service. 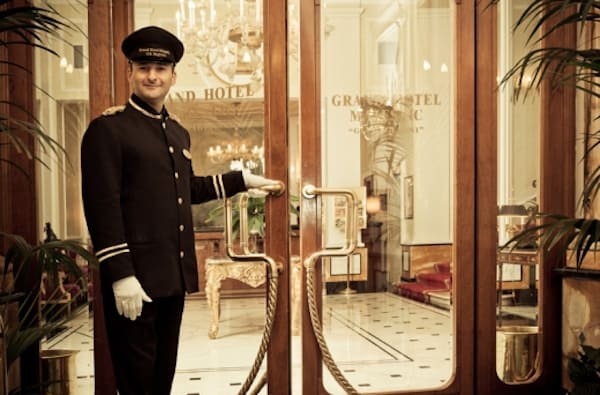 When it comes to service, the Grand Hotel Majestic“già Baglioni” is a seamless operation with a cohesive team that strives for and achieves perfection. Led by the same general manager, Tiberio Bondi, for more than 30 years (through several changes of hotel ownership), each person we encountered—from the front desk to the restaurants to the bellmen, doormen and housekeeping—was uniformly attentive, warm and welcoming. Both our friends and we fell in love with this hotel, which will certainly be our new “home” next time we visit Bologna. Via Indipendenza and all the surrounding streets in the historic city center are open to public transport during the week (no private vehicles allowed) and are restricted to pedestrians only on Sundays. Because of traffic restrictions in the historic center of Bologna, be sure to get a map from the hotel in advance of your stay that tells you how to approach the hotel by car or taxi. One was sent to us with our hotel confirmation. Because of the scarcity of parking, the cost of parking at the hotel is steep: 45 Euros per night. In our experience, it’s best to avoid bringing a car to Bologna. The city is very walkable with options for public transportation. If you ever tire of Bologna (unlikely), you can hop on the high speed train to Florence and arrive in about ½ hour. Other trains connect to wonderful day trip towns like Ferrara, Ravenna and Rimini. Disclosure: Our stay at the hotel was partially subsidized by Emilia Romagna Tourism but any opinions expressed in this post are our own. Jo and I have yet to make it to Italy, and this article and the others you have posted make me wonder how we can keep putting it on the back burner! The Grand Hotel Majestic “già Baglioni certainly merits using the terms grand and majestic. Your stay sounds wonderful. We love the city and hope to return again! What a lavish hotel the Grand Hotel Majestic looks to be. Interesting to that it’s housed so many famous people including Princess Diana, Frank Sinatra, Ava Gardner and Jennifer Lopez. I love hotels with the patina of age like this one. That KEY! Those CAKES!. Such an elegant place. So old school luxury. They don’t make ’em like that any more! Easy to fall in love with! This looks like a spectacular hotel with outstanding service. It oozed with luxury. That breakfast spread with fresh pastries and bakery items looked so delicious – glad we already had breakfast! I’m still missing the breakfasts! OK, now I kick myself for not going there. I had the chance to go to Bologna on my way home last year. Instead, I went via Genoa. When I read that it was one of your favourite cities in Italy, I now think I missed something special. The hotel alone is magnificent. no wonder you love it! I hope you do get to Bologna. It’s such a special city, just the right size, one of my favorites in Italy! Thanks for the recommendation Irene! Bologna is now firmly written down in our list of “must sees.” What a magnificent hotel with a great history and I love the fact that the hotel incorporated the Roman Road from over two millennia ago! The sense of walking through ages past, centuries-old architecture and antiquity that surrounds us in Europe continues to amaze and delight us! I strongly recommend visiting Bologna. I have no doubt that you’ll love the city and the region! We love Bologna and all the other cities we\’ve seen in Italy. Italians take so much pride in what they do, their culture and ancestry. The fact that they preserved the Roman road in the hotel is great. We are waaay overdue for a return visit to Italy. I last visited this area as a 16 year old, camping near the beach in Ravenna, sharing a tent with my 2 sisters. That was then. Now I’m ready for the more adult, elegant experience you had at The Grand Hotel Majestic “già Baglioni. Very nice review. The Grand Hotel Majestic looks like a decadent place to stay! I really love staying in or near the city center where all the action is within walking distance.